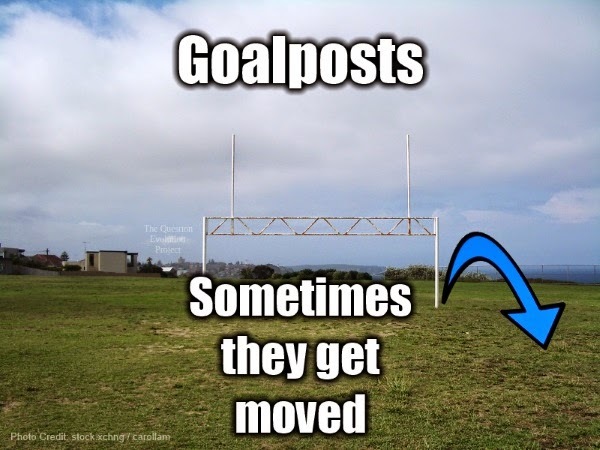 The fallacy of "Special Pleading" is a form of "Moving the Goalposts" by ignoring important information, changing criteria to bolster one's position, appealing to emotions, and similar tactics. Christians and creationists have to deal with this quite a bit. F'rinstance, when I said that Bill Nye used bad science and logical fallacies when debating Ken Ham, I produced abundant supporting evidence. A critic cried, "...I have NOT studied it in detail. However, I note that it FAILS to quote anything Nye actually said at the debate with Ken Ham VERBATIM..." That's a clear example of moving the goalposts and special pleading (as well as the brilliant logical procedure of arguing from something not studied). Owlhoots like this tend to defend their logical fallacies with more fallacies, such as appeal to motive. So, how about Pluto, the ninth planet of the solar system. Oh, wait. It was disqualified, and with apparently good reasons. People don't like it. We want Pluto to be a planet! When does popular opinion decide scientific classifications? An article in Time said, "The People Have Voted: Pluto is a Planet!" Isn't that misleading? Who cares how the people voted? The people's vote did not change the minds of astronomers. A worse title is, "Pluto Is a Planet Again, According to Harvard Astronomers", which is completely untrue. (Secular science, especially the pro-evolution press, pulls this kind of stunt frequently.) They did a bait-n-switch to get people to read the article, and then clarified with, "At least, that is, according to the audience at a debate at Harvard. Astronomers at the Harvard-Smithsonian Center for Astrophysicists (HSCFA) debated the topic “What is a planet?" Mayhaps the definition of "planet" will change, but will that be based on moving the goalposts?